Vignt-et-un :: Standing herself up on everything in sight. Last Monday, Avienne officially made the transition from immobile infant to exploring rugrat. 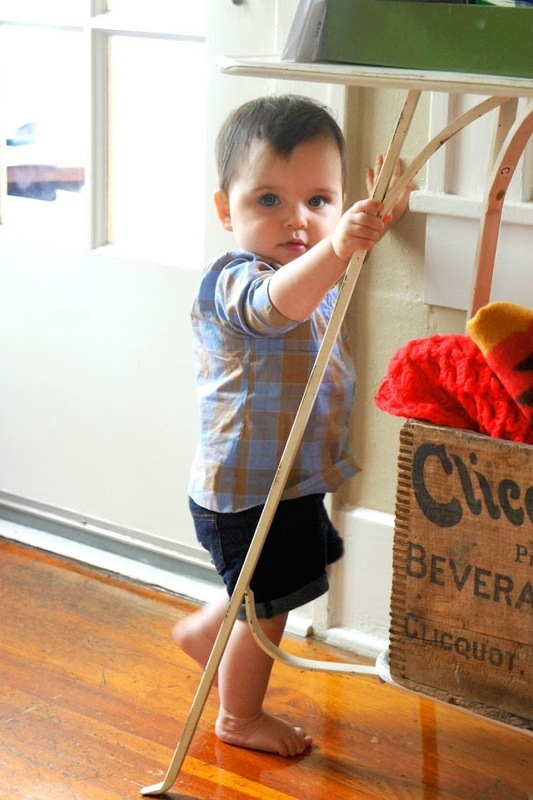 And ever since, she's been crawling all over the house and climbing on anything that offers a new view of her world. She started scooting here and there while we were in France, but it took her a couple of days back home to get into a good groove, and now she's zooming all over the place at full speed. Her current favorite place to crawl to is here, the entryway of our house, where she pulls herself up to take a peek outside before trying to reach for the doorknob. After a week of near-heart-attacks, I'm finally starting to trust her wobbly stance as she figures out how to use her little body to discover new views. It's a little terrifying, but I'm loving this very momentous phase of her babyhood. 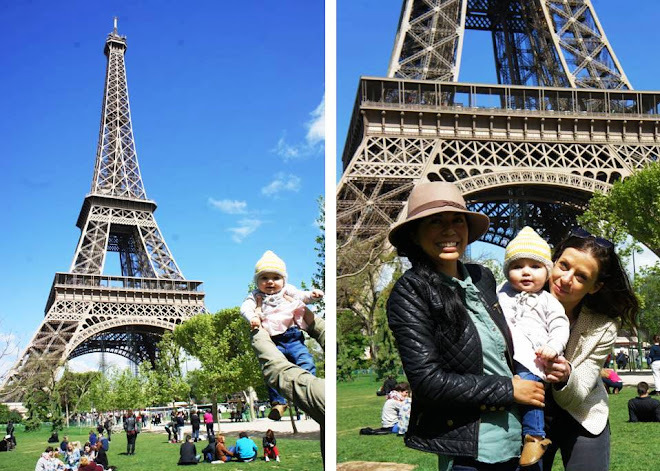 The largest chunk of our time in Paris was spent catching up with family and friends, so luckily, our little girl typically enjoys being around crowds of people. It's a good thing we kiss and squeeze her so much, too because she barely had an inch of personal space during these two weeks. With all the attention she got back in France, she'll never have a reason to doubt how immensely loved she so is. ► Avienne spent some precious time with her nana and I couldn't get enough of all the tulips sprouting around the city. ► There was a lot of this going on when Avienne finally met some extended cousins. ► Getting a photo with all of them looking at the right camera and smiling just wasn't happening. ► We brunched with friends at my favorite brunch spot in Paris. So happy! ► One of Gui's very best friends joined us for the day out. ► Our friend Aimee finally met Avienne! ► We took a long walk around Paris after brunching. ► We rounded up a bunch of friends and had a crazy-awesome picnic under the Eiffel tower on what was probably the most gorgeous day ever. 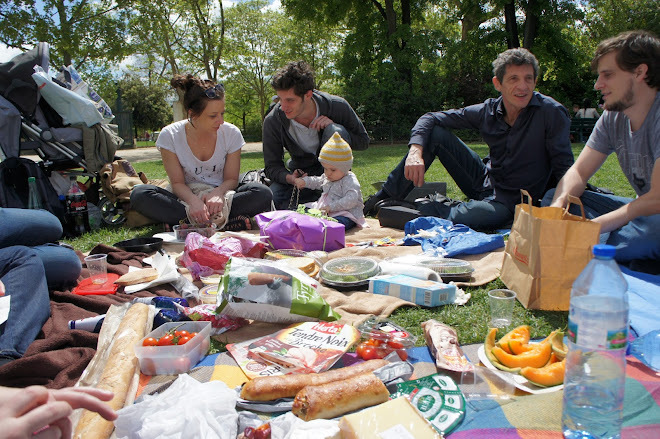 We brought a few of our favorite picnic snacks, but we obviously have a lot to learn when it comes to French picnicking. From prociutto ficelle to chocolate brownies, our friends know how to do it right! ► Gui's dad threw us a lovely brunch, which turned into a family reunion of sorts. It was really special that Avienne was able to meet one of her great-grandmothers. Both of Gui's grandmothers are still living, and we're really lucky that we were able to spend time with both of them on this trip. I think having a baby really underscores how important family is, and that was made even clearer on this trip over. We will always be far away from family no matter where we are living, so we try to soak up as much time with our loved ones whenever they're closeby. 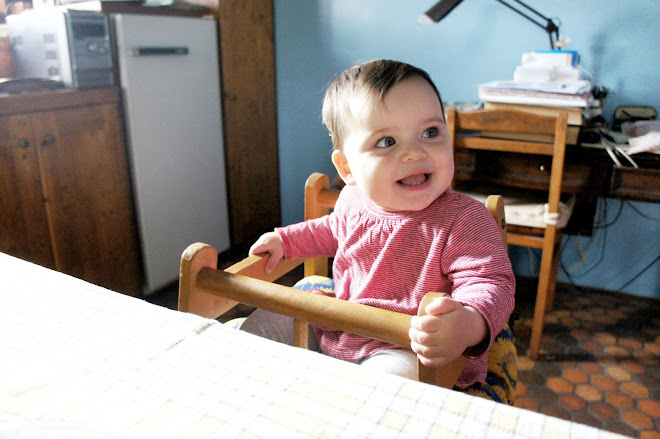 Vingt :: Enjoying all the attention at her great-grandma's house in the south of France. It was so hard to pick a photo from this week because we were in so many places and doing so many things, and there were about a million photos taken of it all. We spent a couple of days this past week in a small town outside of Nice where Gui's grandparents live. Their property is dreamy: the house was built entirely by hand by his grandparents, they have a lovely pool, a huge vegetable garden, and about a dozen olive trees that they produce all of their olive oil from. It was a good place to take a breather after a few hectic days in Paris. Avienne enjoyed so much being the center of attention the whole time there, but especially at mealtime where she ate lots of new foods and entertained us with silly faces and random applause. Wonderful new memories were made in a house full of old ones. Avienne met so many new family and friends in France, and as exhausting as it all was, I feel a huge sense of accomplishment that we were able to meet up with so many folks in such a short time. I still have to sort through a crap-load of photos from this trip, but here is the first set of my favorites from the beginning of our adventure. ► Of course, family reunions call for cheese plates and fruit-covered tarts. 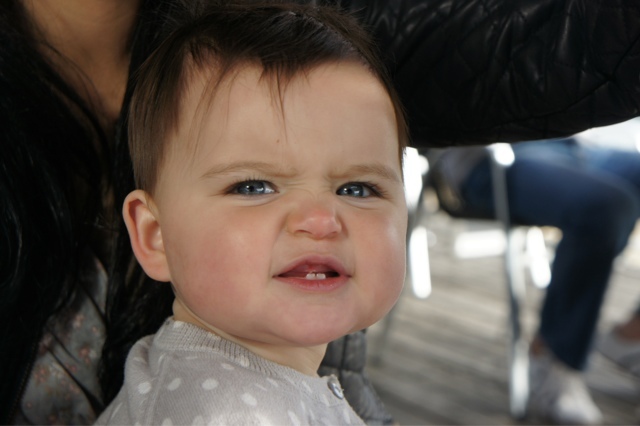 ► Avienne took her first trip on a train to visit friends in Caen. ► ...and we barbecued (well, our hosts barbecued...I just ate and drank wine). ► Fun times were aplenty, as usual. ► We took a ferry to a little island called Chausey. ► Avienne had a glorious time playing in the dirt with a new friend. ► We enjoyed a beautiful and peaceful day on the island, then headed back towards Caen before catching the train the next morning for Paris. I'm so glad we decided to start our trip out with a side-trip to see two of our absolutely favorite people. It helped us rest up and relax a bit before we started bouncing around Paris. 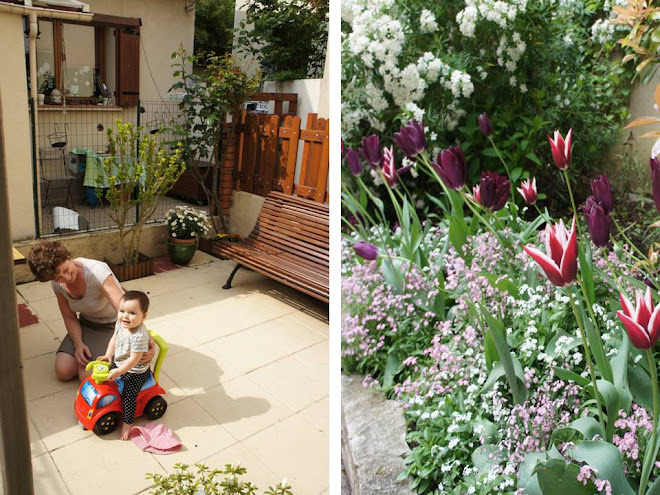 I always leave Normandy ready to take on anything - somehow, it's where I always find my reset button. Dix-huit :: Smiles for days. We're visiting family and friends in France right now, so sorry this post is a week late. This is pretty much the face we've been seeing since we got here. Avienne has been so much fun to travel with, and I think it has something to do with this scrunched-up smile she's been giving everyone she meets. In the airport, on the train, at restaurants and in the park - she throws this smile out everywhere she goes.